Once upon a time, I needed a 30" monitor. I say "needed" because my second work portable, a MacBook Pro with an early Display Port, didn't play well with my original 30" monitor which required the notoriously flaky Apple Display Port to Dual DVI adapter. And I definitely wasn't in the mood to fight my monitor whenever the pager went off at 3:07 AM. It's sort of an odd (but honest) definition of need. For those keeping score, this means I would have two 30" monitors. Many households would consider one 30" monitor excessive, especially since I also had a 24" loaner monitor from work. Thus, Spousal Approval Factor (SAF) was not a trivial consideration. However, I married within my species. We were not even dating yet when when I asked to use Katherine's initials for kew.com, and, like a true MIT geek, she thought it was cool. Likewise, she was cool with the monitor, especially since she knew about my on-call duties. It's nice to be understood as the years go by. But even with an inventory that includes eight Raspberry Pi computers, five networked stereos, four Macs, three Wifi access points and a nearly fully 24 port network switch in the pantry, I still try to have good manners. Trust but verify, as Ronald Reagan once said. Which brings us to this weekend. A Raspberry Pi 2 provided network management at the Kitten Farm Pacific Northwest, and yesterday during routine updates it decided to scramble the SD card it used as its disk. 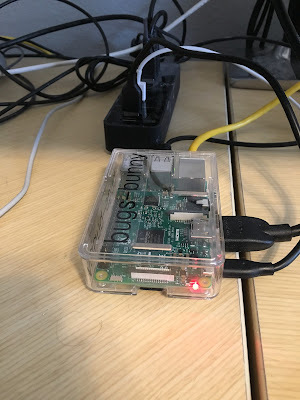 This was not good, but not fatal -- there's a reason I backup each Raspberry Pi's configuration and other critical data nightly. Bring a new (faster) machine online. I chose the latter, and got things squared away enough by the evening to put the new machine online. So, the replacement was online but still sitting on my desk. I then physically looked at the beast. The old unit had a dark opaque case which gave it low visibility; the new one was ... different. It dawned on me that the style conscious among us may feel a clear box with glowing LEDs and the general appearance of the incubator for a baby Terminator does not belong on the living room entertainment center. So I asked. Katherine's reply: "That's fine. Entertainment Centers are often the geekiest part of a house. And anyone who walks into this house should know what to expect." I definitely married within my species. Update: A different, faster machine went downstairs. Thus the case ended up being a bright semi-transparent pink, not clear. Also spouse approved, of course. p.s. She has bought me three smaller monitors for various purposes since I got the 30" monitor. Is that love or what?